Welcome to Alpin Panorama Hotel Hubertus****S in Olang! Enjoy outstanding holidays in South Tyrol and let pamper you in Alpin Panorama Hotel Hubertus****S in Olang. Our hotel is located in the heart of the Dolomites, at the foot of Mt. Kronplatz – South Tyrol’s skiing area no. 1. We will welcome you with warm hospitality and attentive service in an inviting and luxurious ambience. For sure, the absolute highlight at Hubertus is our heated 25 m sky pool of transparent glass, which completes our extraordinary water world. 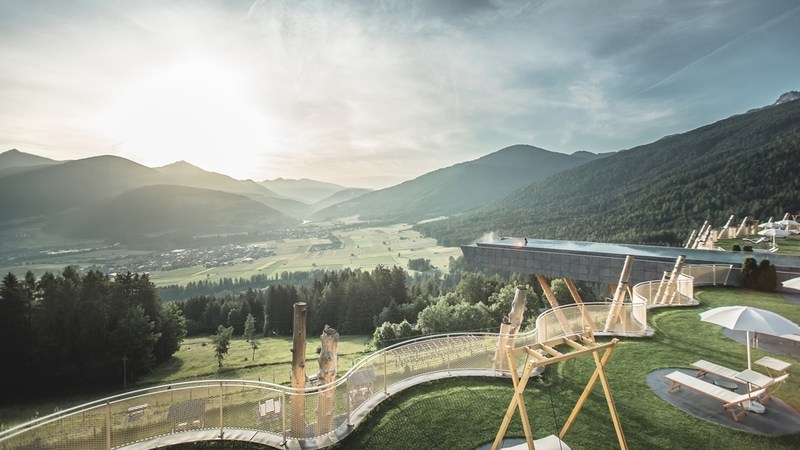 Enjoy dreamlike moments of relaxation in our 5,000 m² big Alpenreych Park with 6 heated outdoor pools, oases of relaxation, a new Blockhouse sauna and a panoramic Alpine sauna. 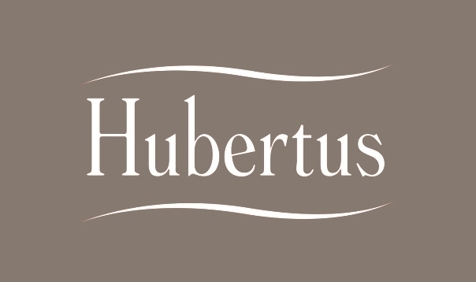 Hotel Hubertus offers furthermore a sensory pool indoor (30°) and a sauna area with herbal sauna, steam bath, infrared cabin and much more. The Alpenreych Spa provides a rich programme of classic, alpine and Ayurveda treatments. Our ¾-board takes you on a culinary world trip with typical South Tyrolean specialties and Italian evenings. You can enjoy a view of an impressive mountain panorama from the roof terrace of our hotel. In the surroundings of Olang you can find numerous possibilities for exciting leisure time activities all the year round. The private shuttle bus brings you directly to the 120 km slopes of the skiing area Kronplatz, which are only 500 m from the hotel away. We offer also snowshoes to lend for free. As member of the best alpine Wanderhotels (hiking hotels), we offer a varied programme of guided hikes in different levels of difficulty. Large, panoramic rooms (45 m²), comfortably furnished in traditional country house style, with separate entrance, traditional cockle stove and comfy sofa for relaxation. Dream away the time in the luxury bathroom with panoramic stand-alone bathtub, shower, separate WC with bidet, and relax on the huge terrace with breathtaking views of the valley. Stay in our panoramic rooms (42m²) in chalet style with wood floor, walk-in wardrobe, cosy cockle stove and comfy sofa. Special moments you expect in the luxurious bathroom with panoramic stand-alone bathtub, shower, separate WC with bidet. Relax on the spacious panoramic balcony with a unique view of the valley. Spend some romantic hours in our traditional country house style rooms (40m²) with panoramic views. Larch wood floor, traditional cockle stove, comfy sofa, sophisticated bathroom with panoramic stand-alone bathtub, shower, separate WC with bidet and a balcony with a magnificent view – all this combines to make the room something special. In some rooms the sofa and the double room are seperated by a sliding glass door. The new lovely double rooms (30 m²) bring the nature into the room and impresses with natural oak furniture and oak flooring. The bathroom excites with shower, WC and bidet. From the balcony let yourself be enchanted by the marvelous panoramic view of the Alpenreych Park and our mountains. Lovely double rooms (30m²) furnished in country house style, larch wood floor, lounge area with writing desk, shower, WC, bidet and balcony. Let yourself be enchanted by the breathtaking views of the valley and our mountains. New welcoming single room (30 m²), with XXL bed, furnished with natural oak furniture, oak flooring, bathroom with shower, WC and bidet. Balcony with lovely panoramic views of the Alpenreych Park. New single room (21 qm²) furnished with natural oak, XXL bed, shower / WC and balcony. New roomy family suites (55 m²) natural oak, with two bedrooms and two bathrooms with shower, WC and bidet. Wonderful panoramic view of the Alpenreych Park. Family panoramic suites (82 m²) in chalet style with wood floor, walk-in wardrobe, 2 separate bedrooms with stove and comfy sofa. 2 luxurious bathrooms with panoramic stand-alone bathtub, shower, separate WC with bidet. Relax on the spacious panoramic terrace with a unique view of the valley. A paradise for the family – Panoramic suites (92 m²) in our traditional country house style with 2 separate bedrooms, a cosy cockle stove, 2 independent luxury bathrooms with panoramic stand-alone bathtubs, shower, separate WC with bidet. Enjoy the terrace with its breathtaking view of the valley. Loving apartment in a charming country house style with spacious living room with dining area, double sofa bed and a separate kitchen. The kitchen is fully equipped with electric stove, dishwasher, coffee machine and fridge. 2 bedrooms invite you to dream. The bedding we make at your disposal on arrival. The bathroom with shower has a sink, bidet and toilet, hair dryer and towels. The apartments are equipped with 3 TV’s, safe and hand cleaner. 1 TV you find in the living room and the other 2 in the bed rooms. Children beds and chairs you get on request. From the apartment you can enjoy a great view of the mountains.